Dust Collecting Systems Dust collecting systems are coordinated sets of equipment that work together to minimize dust particle contamination in workshops, plants and manufacturing facilities. Nearly every fabrication industry has processes that release millions of particles into the air, from wood dust or metal dust to very fine, respirable chemicals and smoke particles. Industries that utilize dust collecting systems include coal handling, cement fabrication, metal fabrication, mining, chemical processing, furniture, recycling and agricultural industries, among many others. Although dust collecting systems can take up a lot space and are not easy to reconfigure once designed, the benefits of employing effective, efficient dust collecting systems can improve equipment longevity and worker health. Many dust collecting systems involve an assembly of dust collection equipment such as overhead ductwork, capture arms and suction hoods which hang over the workspaces where dust is formed, and a central suction unit which pulls the air into one or more dust collectors. A single dust collecting system may employ just one type of dust collector or multiple different types of dust collectors, such as bag houses, jet dust collectors, settling chambers, baffle chambers and cyclone dust collectors. 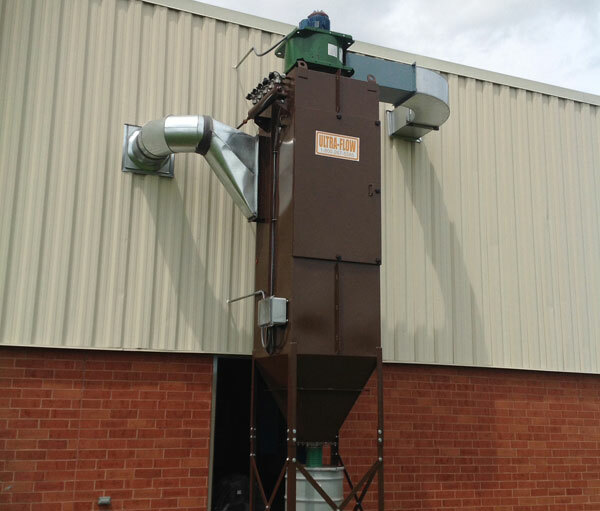 As the most common dust collector design and often the most efficient, baghouses draw dirty air in through ducts to a hopper-shaped baghouse containing fabric filters. The air is pulled through the fabric bags by a vacuum-creating fan, leaving behind dust, smoke and particles; clean air exits through the fan at the outlet, while dust particles settle into an airlock at the bottom of the hopper. Jet dust collectors are a specific type of baghouse which use jets of reversed air to shake the dust-caked fabric bag filters free of dirt. Cyclone dust collectors are inertial separators which use centrifugal, or cyclonic, air movement within a hopper-shaped chamber to separate particles from the air; the particles, being heavier than air molecules, are thrown against the outer wall of the hopper and fall to the bottom, where they are collected. Other dust collecting systems involve the strategic use of either portable or permanent cartridge collectors for localized dust collection. Downdraft tables are normally self-contained dust collection systems that operate as an independent work area, though they can in some cases be tied into the duct work of larger dust collecting systems.